← Can Entrepreneurs Have Work-Life Balance? 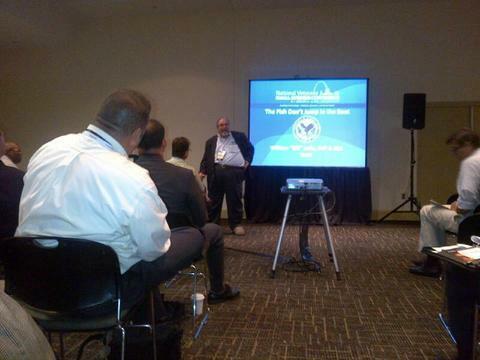 Following up from my successful presentation for the National Contract Management Association, on August 7th I gave a standing-room only talk at the 2013 National Veterans Small Business Conference (NVSBC) put on by the Department of Veterans Affairs. While the group at NCMA was more mixed between businesses, PTAC people, and OSDBU types, at the NVSBC the audience for my presentation was almost entirely business owners and business development folks. They were about evenly split between new businesses and more established businesses. Sure you can, you just have to be aware that there are things they can and cannot say. This is a relationship you absolutely need to establish, because this is the only person who can legally sign on behalf of the government. You’re not authorized to do anything until the contracting officer signs. Your customer is the person who orders the services and wants you to do the work, and will deliver your technical instructions. However, they do not have the right to approve whether or not you are granted the work. The NVSBC was quite a bit bigger than the NCMA, with lunch settings for 3,000 people. The exhibit hall was expanded so our placement was slightly different than when we registered, but it still worked well for us and our booth was constantly busy with good traffic. So much so that I never really got around to see the other exhibits. As I’ve said many times, business comes down to relationships, and being in the booth gave me the opportunity to catch up with people I don’t see in person very often, as well as make new connections – including readers of this blog! Several people commented that they appreciate the concrete advice here, and asked for my recommendations for their situation. It was very gratifying to see the impact of this blog. If you’re in the Washington area, there is another learning opportunity happening next week. It’s called the Summit for Success, and it’s being put on by American Express OPEN Forum (OPEN for Government Contracts division) – they have a good track record for delivering solid information. The event takes place on Tuesday, August 20, 2013 from 8:00 a.m.-4:00 p.m. at the Grand Hyatt Washington in Washington, D.C., and includes four breakout sessions, hands-on learning opportunities, and networking with other small businesses, large prime contractors, and government officials and buyers. This is a free event that is well worth your time. You must pre-register, so don’t miss out! Were You at the NCMA Conference?